If you’re in need of cash, you might be able to get some easily, quickly, and at an insanely low-interest rate. Many people are not aware that a low-interest balance transfer offer from a credit card can be turned into a low-interest loan, with the funds available in your account in just a few days. I see the offers almost every time I sign into my credit card accounts online. Low-interest balance transfer offers, sometimes as low as 0%, being offered for 6, 12 or even 18 months. Many people think these offers are simply to transfer a balance from a high-interest card to a different account with. However, there’s usually an option to have funds deposited directly into your checking account. Checking Account Number: You’ll need to register your checking account with your credit card’s online account management portal. You can get this from a check blank, or from your bank directly. Bank Routing Number: Each bank has it’s own unique routing number. The bank’s routing number along with your account number is needed to direct the funds to your account. Select Direct Deposit: When you initiate a balance transfer, credit card online management tools will ask how you want the funds delivered. You can supply a credit card account number to have the balance transferred, have a check mailed to you, or have the funds deposited directly into your account. Direct deposit is the fastest way to get the funds. How Fast Will I Get The Funds? Usually, the funds will be deposited into your account within 2 or 3 business days. Normally there are fees associated with taking advantage of balance transfer offers. You have to do the analysis is doing so is in your best interest. Know how much you’ll be paying in fees and interest, and have a plan to repay the advance. If you find yourself in a position where you need cash fast, a balance transfer offer may be a great way to get a low-interest loan. It’s easy, as you don’t have to go through a long application process with a bank. The funds will be delivered fast, usually within a few days. If you do the research, know what you’re getting into and have a plan to repay the funds, a balance transfer offer could help you through a financial crisis. 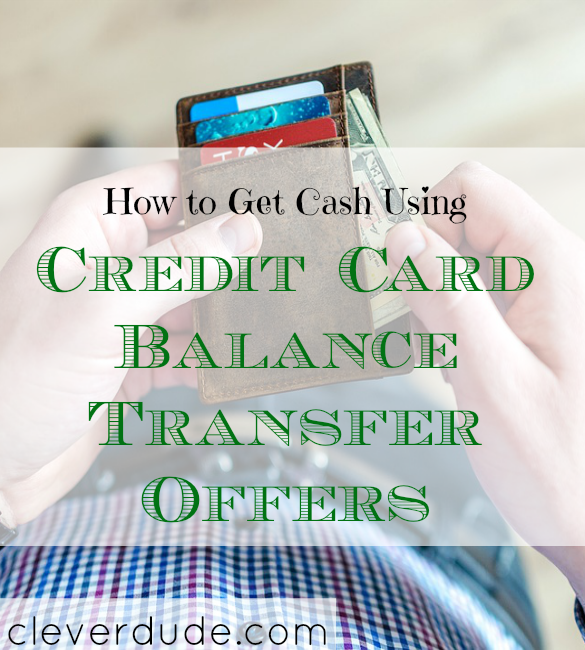 How about you, Clever Friends, have you ever used a balance transfer offer to get cash? Why would you do that? Why not just get a savings account and save up an emergency fund? What if you had a financial crisis, or unexpected expense that exceeded your emergency fund? What if you had a series of unexpected expenses that drained your emergency fund and you hadn’t had a chance to rebuild it? The point is, this is an extreme measure that could be utilized in an extreme situation.